Mumbai: The rupee dropped by the most in almost two months on speculation overseas investors will cut local holdings as Asian corporate profits shrink amid an economic slump. “The rupee is weaker because equities were lower across Asia, raising concerns about capital outflows," said Sudarshan Bhatt, chief currency trader at state-owned Corporation Bank in Mumbai. “Selling in non-deliverable forwards is also influencing the local market." The rupee weakened 1.5% to 48.12 per dollar at the 5pm close in Mumbai, according to data compiled by Bloomberg. The decline was the biggest since 16 September. The Bombay Stock Exchange’s benchmark index, the Sensex, fell 6.6%, the most since 24 October. Funds based abroad sold local equities worth a record $12.6 billion more than they bought this year, data released by the Securities and Exchange Board of India show. Growth in India’s industrial production declined to 1.3% in August from a year earlier, the slowest on record, a government report showed last month. Companies including Ashok Leyland Ltd, India’s second biggest maker of commercial vehicles, and JSW Steel Ltd, the nation’s third biggest producer, announced production cuts this month. “We believe the downside risks to growth in India have increased," Barclays Capital said in a research report. The central bank won’t “cap the currency at any particular level and will manage the pace of depreciation." The local currency touched a record low of 50.29 a dollar on 27 October before rebounding as much as 6.6%. 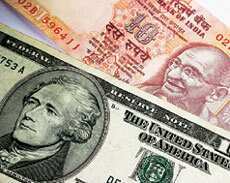 The Reserve Bank of India (RBI) stemmed rupee losses by selling dollars. Foreign exchange reserves dropped for six straight weeks through 31 October, RBI data show, indicating the monetary authority intervened. Barclays expects the rupee to decline to as low as 53 by the end of the year, and said its view “assumes that risk aversion toward emerging markets and the global growth slowdown" will continue in the next few quarters. India’s gross domestic product may increase 6% in the next two-three quarters, a pace not seen since March 2003, the report said. Offshore forward contracts show traders increased bets for how much they predict the rupee will depreciate over the next month, showing an implied rate of 48.72 a dollar compared with 47.83 on Monday. Forwards are agreements in which assets are bought and sold at current prices for future delivery. Rupee forwards traded overseas are non-deliverable, meaning they are settled in dollars rather than the local currency.